I want to learn to be a better painter. I think this is something all painters strive for no matter the progress they’ve made in their lives and the paths they’ve paved for younger generations throughout the history of art. Photograph of my still life. I don’t think we really learned any kind of absolute technique, or discipline in my undergraduate art training. We just used the grid method to transfer our photographs or thumbnail sketches, and went at it with no particular disciplinary painting style, structure, or suggested stages. We had two weeks to finish each assignment, so maybe time put some constraints on things. I do recall suggested literary references on the class syllabi, which we rarely actually consulted because of the constricted time demands of being a full-time student at a 4-year college with a Visual Arts program. The whole putting-paint-down or color, or whatever, it was rather free-form. This isn’t to say that our training was lacking anything. We had very good professorial guidance throughout, but most of the emphasis was placed on the foundations of good composition, good draftsmanship, and good color use. Technique was thought of as something much more personal that followed, like handwriting styles after learning penmanship. My artwork, my paintings, they’re all over the place. That’s not the fault of my training, that’s just who I am, who I’ve always been. It’s been almost 5 years since I graduated with my BA in art, and I still feel like I’m lost and floundering. I feel like I’m faking it, like a chameleon, and I don’t know how to paint true to myself. So, time to go back to basics. I was drawn to the salmon color of these carnations last week, at the grocery store. On my desk, in my thrift store abalone pitcher, against some of the original woodwork still left from this apartment’s former life as the back portion of a large old “Italianate” style house, they looked to me like they had materialized from a Baroque painting. I took some photographs for compositional reference and did a small bit of web research on technique, then decided to dive in. I am up for the challenge. I started my underpainting in the deep earth color, Raw Umber, with a little Aliz.Crimson and Ult. Blue to ensure depth because of how much thinned down medium I was using. After I am satisfied with my underpainting I plan to continue using classical painting methods by layering in my colors using glazing techniques, and sharpening the final details at the end with dry-brushing, and that awesome word, “scumbling” to emphasize the bright little accents for that final eye-catching sparkle. I hope from this painting I can learn to approach painting more quickly and less ceremoniously. 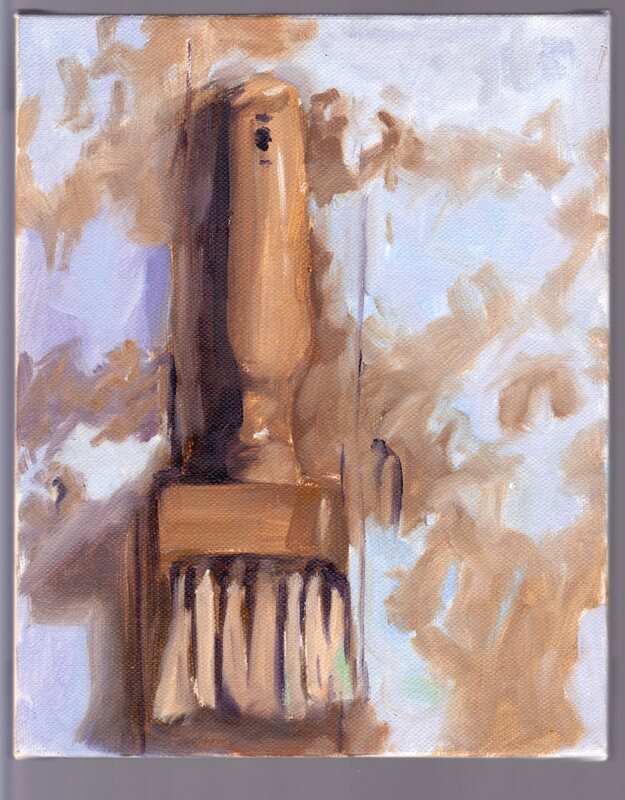 I already am much happier with the outcome of a quick little painting I made yesterday, of a paint brush hanging on a support beam in an old warehouse-turned-artists-studio I was visiting. 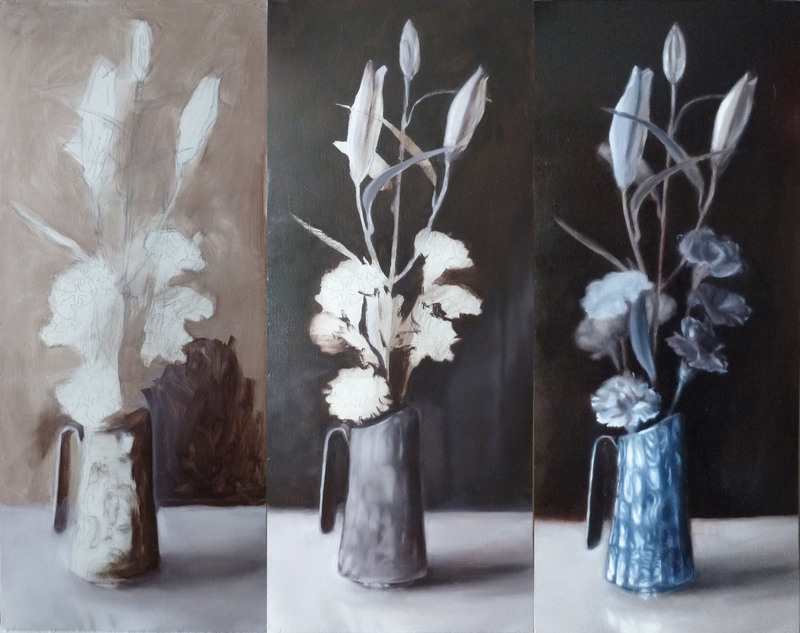 I have a good feeling about this already, that I can loosen up, not get so hung up on details – well – on other quick and smaller paintings, not the carnations still life. That one is all about details. That one is my special project. A learning tool. Tenebrism; the effect of very dramatic illumination. I will be posting updates on this painting as the progress develops. I’m even taking video as I go, and after it is finished I hope to compile the footage into a start-to-finish “time-lapse” video which I will also share. Thanks for reading, and if you haven’t already, please subscribe to my blog to stay updated on the progress of this and other works, and maybe gain a little insight into the life of an artist as well.